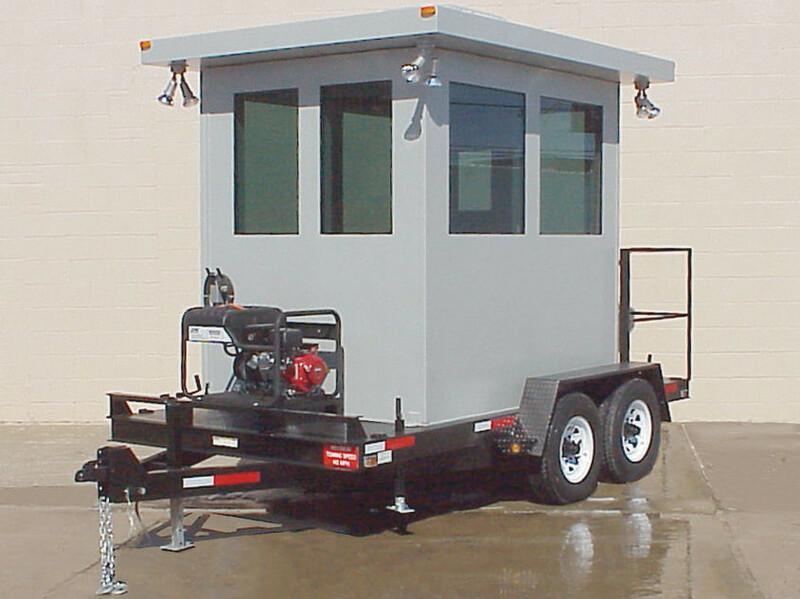 Portable Booth with Trailer – Par-Kut International Inc.
Portable offices are often seen at construction sites and other locations where temporary events are taking place. They also serve well as kiosks, parking booths, airport taxi dispatch offices, toll booths, security guard houses, ticket booths, airport rental car offices and cashiers booths, to name only a few. Portable offices come with many customizable specifications and optional features. A portable office’s basic specifications surround its framework, panels, ceiling, floor/base, roof, windows and doors. In general, the structural members of portable offices are typically comprised of anodized aluminum. Walls, ceilings and floors are usually equipped with a solid impact resistant core, and either an aluminum or vinyl finish. Less frequently, portable offices can be built with wood exteriors. Exterior panels are generally aluminum, while interior panels are mostly some sort of vinyl. To increase durability, panels may be caulked with urethane sealant and fastened to structural members with plated screws. 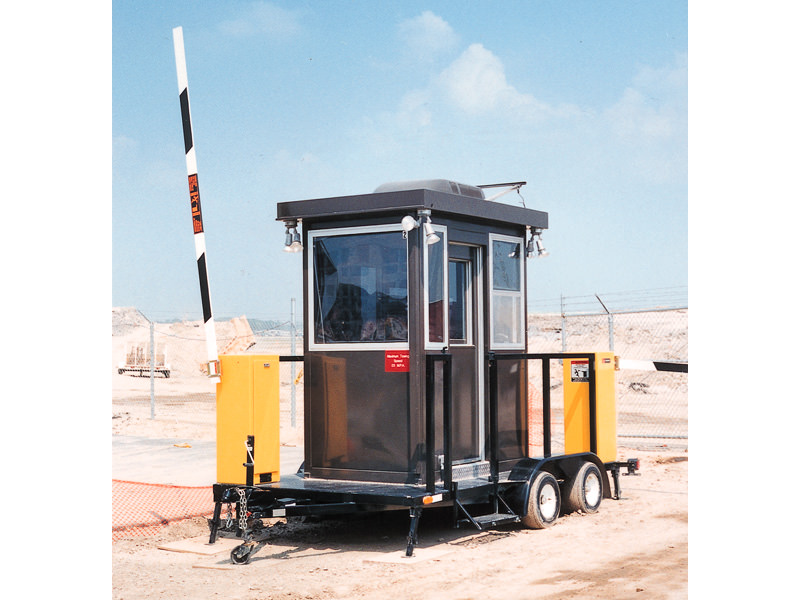 Portable Parking Booth – Par-Kut International Inc.
Ceilings, in addition to aluminum and vinyl can also be made as a t-grid or from pre-finished gypsum. If a customer should so choose, the top panel of the ceiling may be equipped with an aluminum vapor barrier. Portable office bases are specially made with forklift pockets so that they can be lifted and moved without risk of damage. The base is built with thick steel channels that are coated in rust inhibitive paint, then welded with stringers. Floors are usually made of vinyl tile or commercial grade finished vinyl. The sub-flooring is made of OSB board with an aluminum vapor barrier laminated underneath it. A portable office that is being built for use in a rainy area or for a longer period of time can be designed with aluminum gutters attached to the roof on all four sides. Standard windows are usually single or double horizontal sliding, the frame made from aluminum and the sliding sections glazed with clear tempered safety glass. Doors have a bit more variance. They may be swinging or sliding. A sliding door can be made much like a window, with an aluminum frame and safety glass, and a swinging door would likely be made from stainless steel, with an optional window. Optional add-on features include: air conditioning and heating, exterior lighting, thermal insulation, custom exterior painting, special glazing (tinted, insulated, polycarbonate, etc. ), countertops and shelving, locks, standard or through-wall cash and transaction drawers and aluminum tread plate flooring. Portable Offices With the digital capabilities and fast-paced environment of the modern work world, at-home offices or working "from anywhere" has become increasingly popular. Alongside this insurgence of remote or traveling work, have risen portable offices.